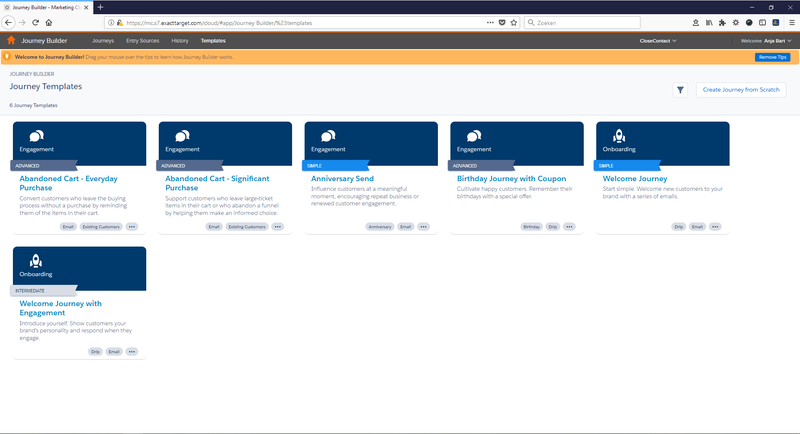 The Salesforce Marketing Cloud January release is here, packed with new features! The first Salesforce Marketing Cloud release of 2018 went live on January 26th. We have picked some exciting new features and improvements to share with you here. If you have logged in to the Marketing Cloud recently, you will already have noticed the fresh new look of the login page that reflects the overall look and feel of Salesforce. When you log in to Journey Builder, you will see the new Journey Templates on the starting screen. Based on common use cases and best practices, these templates make it easy to set up a simple customer journey. More will be added in future. For consistency across the entire Salesforce platform, the ‘Audience’ entry source for a journey is renamed ‘Data Extension’. You can select a Data Extension, filter it (this is optional) and start creating your journey. You can configure your entry source and the rest of your journey without worrying about the schedule, as scheduling your journey entries has been separated from defining your audience. The new configuration interface makes it easier to maintain an overview while creating a journey. Likewise, the Send Email activity within Journey Builder has a new look and also reflects the way email activities are set up in other builders and studios. Salesforce is officially retiring Classic Content. Support will end from January 2019, and its end of life is scheduled for July 2019. A verification step was added to all existing locations where users enter From and Reply Email Addresses, such as Account Settings, My Users, and Sender Profiles. Domain verification is automatically enabled for new customers. Existing customers can request to have it enabled immediately. It will be a required feature in a future release. The reports within Email Studio are no longer updated, Analytics Builder Reports replaces Email Studio reports for all Email and Content Builder reports. The Radian6 Analysis Dashboard will be retired from the Marketing Cloud on May 1, 2018. All users need to switch to Social Studio Analyze. In Social Studio, you will notice the enhanced Twitter experience. You can @ mention one or more Twitter authors, use up to 5 MB search for usernames in the Twitter composer to tag in your tweets and add alt text to images. Facebook: if you need to take the conversation private or respond to a question and hide the original request, you can now hide posts, comments, and replies on Facebook itself and in Social Studio. Facing a (social) media crisis? Don’t panic! With Crisis Management Mode enabled in the Admin organization settings, Super Users and Admin Only Users can halt all outgoing publishing. When Crisis Management Mode is on, a banner appears in the Workspace Calendar to inform all users that outbound publishing is paused. The mobile notification center is now available in the Android app, you can now get the same notifications that are available in the desktop version on your Android device. You can find the full release notes for the Marketing Cloud January release here.